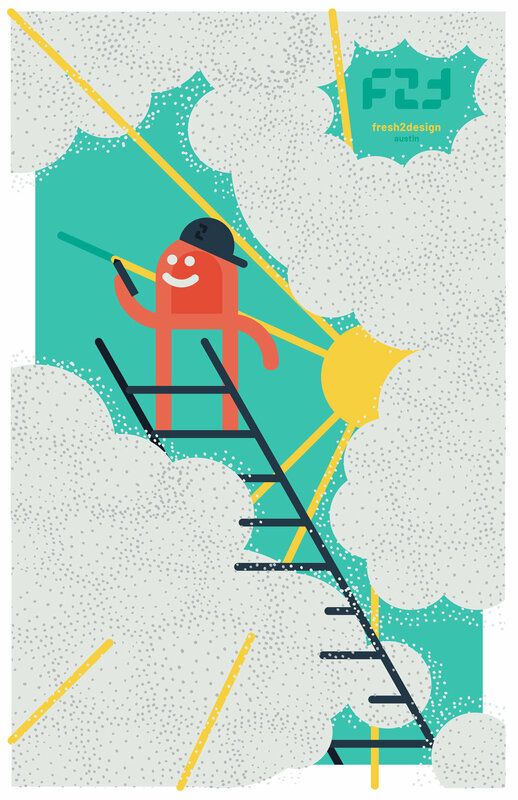 Brand development, strategy, art direction and UI/UX for an extremely fast-growing design community in Austin, TX. At three years old, the organization was already experiencing growing pains and struggling to structure itself. On the surface, f2d only had a branding problem. Internally, however, the organizers were overworked. Fresh2design is off the books and still working on its non-profit status, so the organizers only had time outside of their full time jobs, and absolutely zero budget. 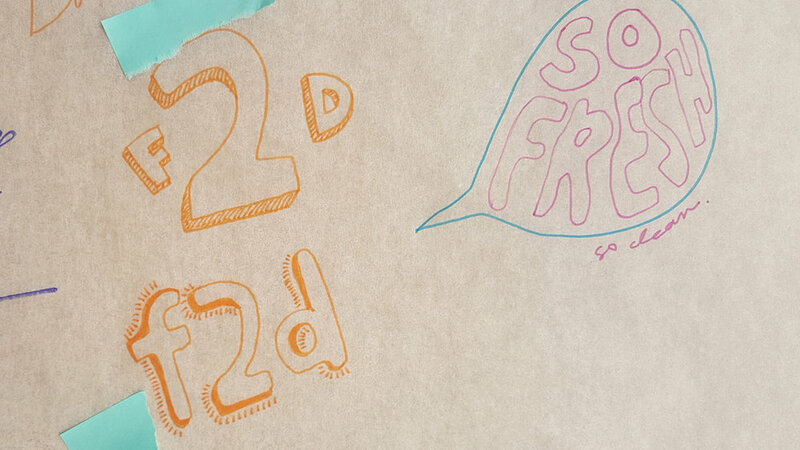 With our post-it notes and sharpies in hand, we set out to streamline fresh2design from the inside out. F2d creates a diverse and inclusive environment in which its members can grow. F2d understands that each of its members has something fresh to offer the industry, and wants to return the favor by offering unique programing, and exciting opportunities. Much like the organization itself, the new trademark is all about perspective. The ambigram is made from shapes that symbolize growth and modernity—while remaining true to the group’s fresh roots. “fresh2design” and the city name are always lowercase to remain casual and approachable, and to keep the mark from looking too corporate. City chapters are differentiated using color, as long as no two cities within the same state use the same one. Fresh2design is a group of emerging professionals who are fresh, but not naive. The brand voice is 'profesh' but not stuffy, and f2d speaks to its community with a sense of humor and a sense of purpose. The color palette was chosen to be graphic and eye-catching. Each color serves a specific purpose within the brand, whether it represents a certain event, city, or one of the 5 pillars. Barlow, a free Google font, was chosen for its modern structure, rounded corners, and the flexibility of its 18 different styles. For consistency, bold is used for headlines and regular for body copy, unless an unforeseen circumstance presents itself. Hand-drawn patterns enhance fresh2design’s friendliness. To avoid chaos, patterns are applied on a same color background—either light on dark or dark on light. 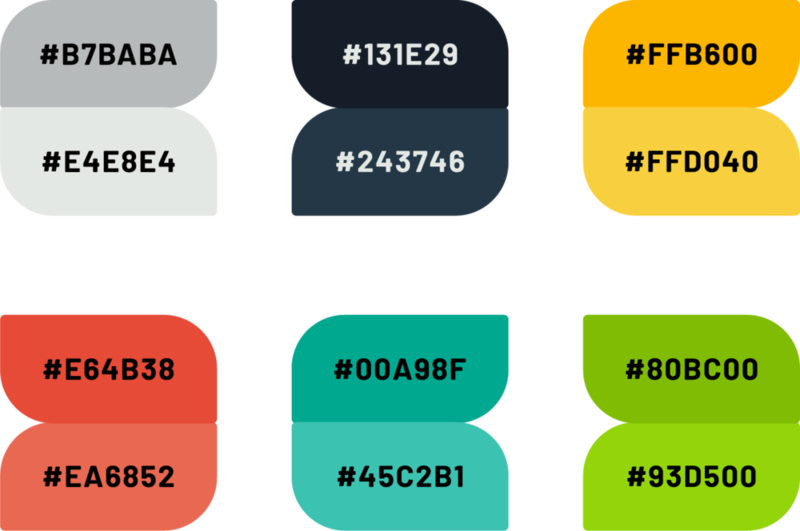 Each recurring f2d event has its own color and pattern combination for easy recognition across platforms—but the patterns themselves in different colors can have multiple uses. Fresh2design conducts most of its business on social media. Since each platform’s flow and voice is different, different kinds of content has a home on each social media site. We’ve created this flowchart to make it easier to know what goes where. Through our research, we found that the Instagram accounts with the most impact are curated, current, and depict a desired lifestyle. Events are announced using one of the templates below, then followed up with an image or carousel gallery and a brief recap after the event has passed. In this format, the fresh2design instagram will follow a one to one graphic and image grid. Facebook is for sharing information. The platform is used to provide detailed information about events parallel to Meetup, for member spotlights, and as a platform for open discussion between members that exists outside of Slack. Twitter is used to promote other individuals from the fresh2design network, and for live promotion of an event as it's ongoing. Twitter takeovers are also totally a thing. Event sponsors can choose to sponsor a fresh2design Snapchat filter that includes their company name. Filters are styled to look like digital polaroids and match specific event branding. At events, fresh2design and a swag sponsor provide name tags for all attendees. Stickers are provided as well in the hopes that members will get creative with their space and show off a bit of personality. Buttons and koozies allow members to rep their f2d status wherever they go, and provide some long lasting advertising for sponsors. 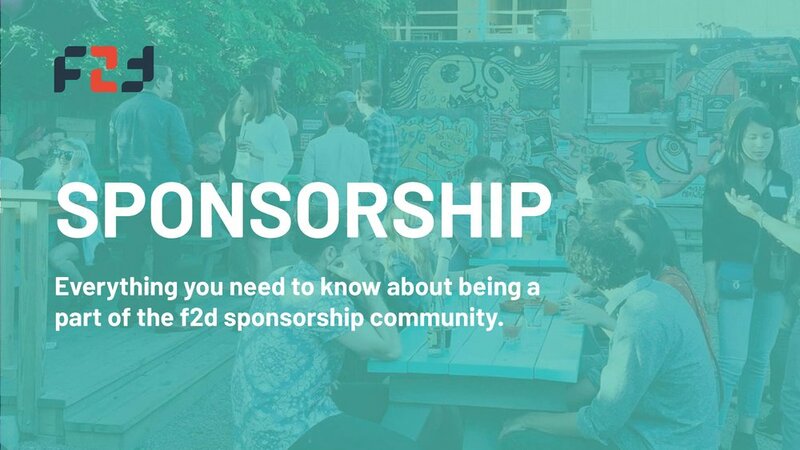 The new and improved f2d website is a one stop shop for members, curious non-members, and potential sponsors. 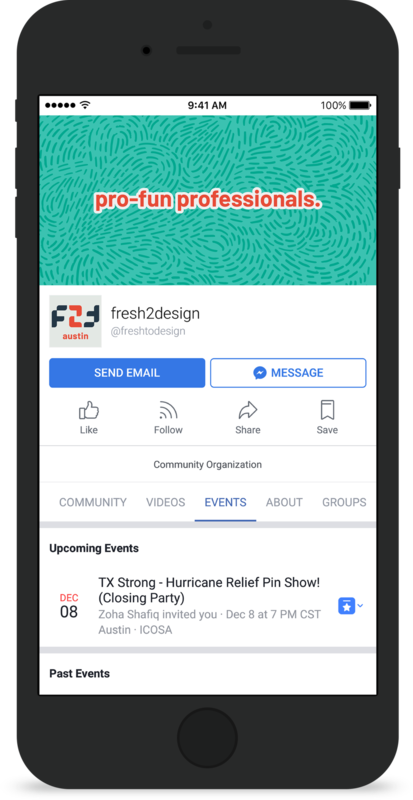 fresh2design has a very strong internet presence, but needed a hub for all organization-related information to live in one place. This gives f2d an organizational platform to store important information for their audience to access. Without non-profit status, the f2d organizes can’t touch a single cent. But, since you gotta have funds to have fun, they had to come up with other ways to provide members with unique programming without charging a dime. That’s where sponsors come in. Sponsors can host, pick up a tab, or provide swag. The sponsorship packet outlines the key benefits of helping out, and provides a breakdown of what sponsors can do.